In the exotic land of Marrakesh, scholar Omar Bakhoum joins an airship expedition into the freezing north in search of a legendary country called Ysland. There he hopes to learn the secrets of the afterlife from a lost race of sages, but howling ice storms, legions of ghosts, and a deadly samurai stand between Omar and his goal. His journey has barely begun before the members of the expedition team begin dying of a mysterious condition, one by one. As the last remaining foreigner on board, Omar is accused of the murders and he quickly finds that an airship high above the frozen sea is a dangerous place to fight for his innocence, or his life. This was a rather interesting novella. But it is one that is rather hard for me to review as I am not able to solidify in my mind just what I thought. I do know that I did enjoy and it was a good quick read. So instead of my normal style of reviewing let me instead bring up a couple points that struck me. On one hand it does introduce the reader to the world, in a way. I feel however that it just barely scratches the surface as it appears that Mr. Lewis has done an excellent job of world building. And this is a world that I am looking forward to exploring more. The genre is one that I am beginning to like more and more. Steampunk really hasn't been as over used as a lot of the genres so there is always something unique to each story. OMAR THE IMMORTAL didn't delve very deeply into the machines of this time other then the airship. Hopefully future stories in this series will. Now we come to one of my pet peeves in a novella. Character development. 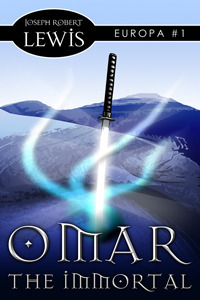 After reading the entire tale Omar is as much a mystery as when I first started the story. So needless to say I would liked to have had more insight into him. I did find it to be an interesting twist that the main character was Middle Eastern rather then European. Would I recommend this story. Yes I would as long as the reader is just looking for a good quick read as an introduction to the series. I rate this story a 3.3. **I was given this book by the author thru Library Thing in exchange for a honest review.